Late with tegra 3. Will it be a success without a new os as a launch partner? 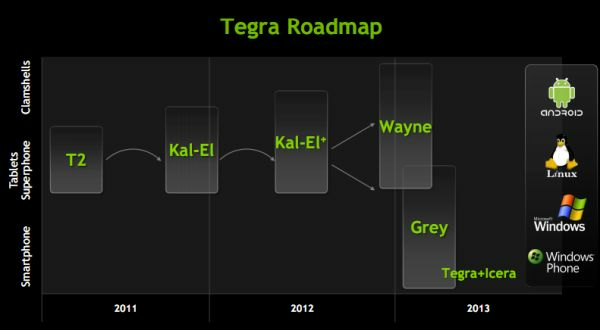 Last week NVIDIA provided an update on its Tegra SoC roadmap. Kal-El, its third generation SoC (likely to launch as Tegra 3) has been delayed by a couple of months. NVIDIA originally expected the first Kal-El tablets would arrive in August, but now it's looking like sometime in Q4. Kal-El's successor, Wayne, has also been pushed back until late 2012/early 2013. In between these two SoCs is a new part dubbed Kal-El+. It's unclear if Kal-El+ will be a process shrink or just higher clocks/larger die on 40nm. In the smartphone spirit, NVIDIA is letting small tidbits of information out about Kal-El as it gets closer to launch. In February we learned Kal-El would be NVIDIA's first quad-core SoC design, featuring four ARM Cortex A9s (with MPE) behind a 1MB shared L2 cache. Kal-El's GPU would also see a boost to 12 "cores" (up from 8 in Tegra 2), but through architectural improvements would deliver up to 3x the GPU performance of T2. Unfortunately the increase in GPU size and CPU core count doesn't come with a wider memory bus. Kal-El is still stuck with a single 32-bit LPDDR2 memory interface, although max supported data rate increases to 800MHz. We also learned that NVIDIA was targeting somewhere around an 80mm^2 die, more than 60% bigger than Tegra 2 but over 30% smaller than the A5 in Apple's iPad 2. NVIDIA told us that although the iPad 2 made it easier for it to sell a big SoC to OEMs, it's still not all that easy to convince manufacturers to spend more on a big SoC. Clock speeds are up in the air but NVIDIA is expecting Kal-El to run faster than Tegra 2. Based on competing A9 designs, I'd expect Kal-El to launch somewhere around 1.3 - 1.4GHz. Now for the new information. Power consumption was a major concern with the move to Kal-El but NVIDIA addressed that by allowing each A9 in the SoC to be power gated when idle. When a core is power gated it is effectively off, burning no dynamic power and leaking very little. Tegra 2 by comparison couldn't power gate individual cores, only the entire CPU island itself. In lightly threaded situations where you aren't using all of Kal-El's cores, the idle ones should simply shut off (if NVIDIA has done its power management properly of course). Kal-El is built on the same 40nm process as Tegra 2, so when doing the same amount of work the quad-core chip shouldn't consume any more power.